So this was one of those times where I just wanted to throw everything we had in the fridge together into something before they rot and I throw money away. By some divine coincidence everything happens to be a classic pork pairing of flavors. Smokey bacon, apples, Balsamic Vinegar, and pork. The other classic pairing would be fennel and pork off the top of my head. Instead of making something relatively elegant, I went for monster creation. What does that mean? Wrap the pork chops in bacon, a lot of bacon. Bacon strips, everywhere. So I seasoned the pork chops and wrapped them in 3 or 4 bacon strips. Now in a pan on medium heat with no oil or butter, place the side of the pork chops where the bacon ends meet down on the pan. You want to do this so it holds the bacon on the pork by itself. Next, I put a piece of foil over the pork , and put a bunch of heavy pots on it to press the chops down. I did this because I was afraid the bacon had uneven contact to the pan. I left this going a good 4 or 5 minutes. I checked it to see if the bacon was cooked right, and then turned it repeat. When turned it, I threw in 2 sprigs of rosemary, and 3 cloves of garlic, and basted the chops with the fat. Gross, I know. Once done, I removed the chops onto a cutting board to rest, and I removed the excess fat and rosemary. Then I threw in thin slices of apples skin on, and sauted for about 2 minutes, deglazing with some water. Put some olive oil in another pan on medium high heat, and then just dropped in some cleaned green beans. I cooked it for 2 minutes to get some color, and then added some water and balsamic vinegar and chopped garlic to the pan and covered. After about 2 minutes or so remove the cover and cook for another 30 seconds to reduce the sauce a little. And there you have it, a great combination of flavors. This dish is all about cooking the pork chop right. If it’s dry, it’s just wrong. So if you ever want apples for dinner, serve it with pork. 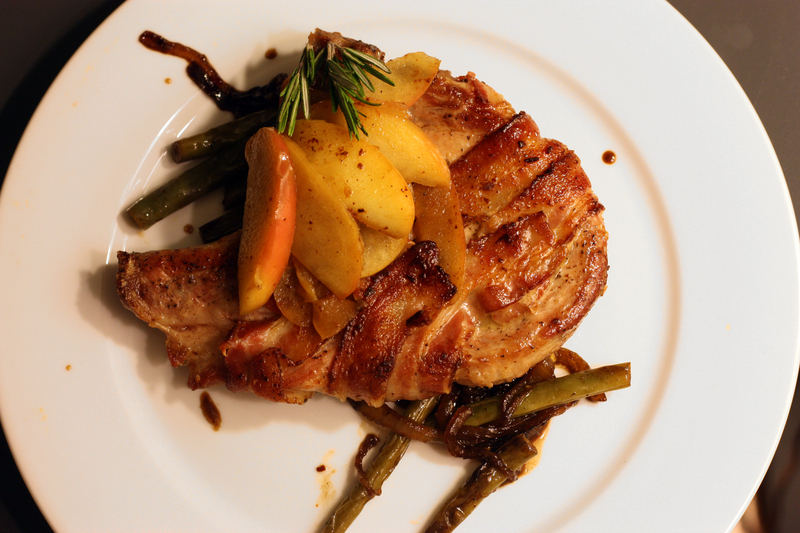 This entry was posted on April 4, 2012 by rrfoods in Dinner, Redmeat and tagged apple, bacon, green beans, pork chops.